Why Select Pest Control Services? People vary in their tolerance for pests that periodically invade our homes and cause us some level of discomfort. The need for monthly, quarterly or yearly pest control services is a matter of your personal preference and your perception of what is (and is not) a problem. Ultimately, the decision on whether you need a routine pest control service is a matter of what you feel is needed to make your home a comfortable and relatively "pest-free" environment. Although you may prefer a "do-it-yourself" approach to pest control, there are situations where the job is best left in the hands of a pest management professional (PMP). This is particularly true with wood-destroying insects such as termites, carpenter ants, and wood-boring beetles. Treatments for these pests can be complex and expensive, depending upon the size of the home, the type of construction, and the extent of the problem. We cannot endorse specific pest control companies, but we can offer some tips to help you reach an informed decision on the type of service you need or want. The emphasis here is on solving specific problems, particularly for wood-destroying pests, but the same general principles apply to regular service contracts for other common household pests, such as cockroaches and ants. Becoming an informed educated consumer is the best way to protect yourself and to make sure you get the kind of service you need and want. Here are some issues to consider when deciding what type of service you need or want. 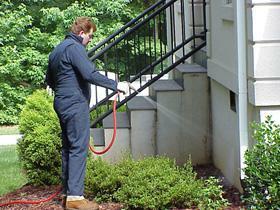 Treating the perimeter of a home to keep pests away. P-phase - covers household pest control (cockroaches, ants, spiders, etc.) both indoors and outside. P-phase also includes vertebrates such as mice and rats. W-phase - covers wood-destroying pests (such as termites, powderpost beetles, etc.) Individuals with W-phase licenses also perform WDIRs (the so-called "termite inspections" for residences being sold). F-phase - covers pests in both the P and W phases, but it specifically involves the use of a fumigant. Please note that a fumigant is not the same thing as a fogger ("bug bomb") that you can buy in many retail stores. Fumigation involves the use of special (and highly toxic) gasses that are released into structures that have been completely sealed or enclosed under a tarpaulin. The removal/exclusion of vertebrate animals, such as snakes, raccoons and bats from houses is usually done by wildlife damage control agents (WDCAs). However, WDCA's cannot apply pesticides (e.g, to get rid of fleas that may be the result of a raccoon or oppossum in the house). Many WDCAs work for pest control companies or they are licensed in structural pest control so they can perform any necessary insecticide treatments. In North Carolina, all pest control companies must have at least one licensed individual (licensee) on their staff. The other employees work under that licensee's supervision. Details about these categories can be found at the NCDA&CS website. License numbers have 3-4 digits followed by letters that designate which phases or types of pest control the company employees are allowed to perform. For example, a company (licensee) with a license number "9999PWF" is able to provide all phases pest control services. On the other hand, a company with the license number "9999P" can perform pest control for household pests (such as those mentioned above), but they cannot perform any treatments for termites or other wood-destroying pests, even if the treatments are applied indoors, rather than to the soil. Make sure that the company with whom you deal has a valid license issued by the NCDA&CS to provide the service you need. All employees of the company who sell pest control contracts or perform pest control services must have an identification cards issued by the NCDA&CS. This card will have their employer's SPC license number on it. Under NCDA&CS rules, the company's name or its SPC license number must be displayed on both sides of every service vehicle. Vehicles used strictly by company sales representatives are not required to carry these markings, although most companies do as a form of advertising). Whether or not the vehicle is marked, ask to see the person's identification card as proof of his/her employment with an authorized pest control company. If he/she cannot produce a valid identification card, you should contact the NCDA&CS. Some companies have separate sales and technical staff. You should feel free to ask if he/she is a technician or a salesperson for the company or if they are a salaried employee or are paid partially on a commission basis. This does not imply that salaried employees are more truthful or more accurate than those working on a commission basis. Asking questions simply shows that you expect to be treated professionally. Treating the soil beneath a slab to control termites. How many pests are seen? How often are they seen? Where are the pests being found? Is there something attracting the pest to the area? Are they entering the house from outdoors? If so, how are they getting indoors? Did it "hitchhike" or crawls/fly indoors? What steps do I need to take in order to correct the current situation and prevent it from ocurring again? Most insect pests are simply nuisances or cause minor problems that can be ignored until they disappear or else can be corrected by vacuuming them up or cutting off their entry/access points. Other pests, such as those that attack stored foods, can often be eliminated by simply discarding the infested item(s) and cleaning the storage area thoroughly. Many people expect pesticides to eliminate all of the pests quickly. This is simply not going to occur in many situations, so don't expect it. Some pesticides, particularly baits, work slowly (but effectively) by design. Also, weather is a major factor in the effectiveness of pesticide applications. Hot dry weather often promotes invasions of pests such as springtails and millipedes and can also make pesticide applications less effective. You need to be reasonably patient to allow any chemical control measures to take effect before you do additional spraying. 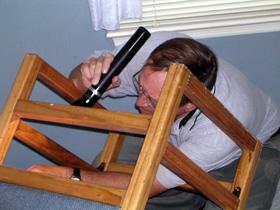 Inspecting a chair for bed bugs. Termites and other wood-destroying insects can cause significant damage if they are not controlled. However, that doesn't mean you need to rush your decision about how to solve the problem. With termite contracts, the pest control company must give you three days in which you may decide to cancel the treatment. It is better to spend a few extra days evaluating the safest, most effective and economical solution. A delay of even several weeks is really of no real consequence in terms of additional termite damage. If your floor was going to collapse from termite damage, it would likely do so regardless of the additional time (and you likely needed the repairs anyway). With pest such as wood-boring beetles, treatments such as fumigation are effective but can be very expensive (in excess of $10,000). For that reason, it's important to make sure that the infestation active AND spread throughout the house. There is a difference between finding termites and finding "conditions conducive to termite infestations." Both situations need your attention, but usually in different ways. 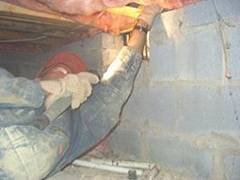 Eliminating conditions favorable to wood-destroying pests, mostly moisture-related problems, usually means repairs or alterations to the crawlspace or other parts of the house or the area around it. Check Termites - Preventing Problems in Existing Homes for more information about what to look for around your home that may create conditions conducive to termite problems. Any evidence of woodboring beetles or termite activity, should be described to you clearly. More importantly, ask if the evidence indicates if the infestation appears to be active or inactive. It is difficult (nearly impossible) to determine the age of termite damage simply by looking at the wood. Claims that an infestation is active must be supported by visible evidence. Don't accept a conclusion of "suspected" termite activity. If the evidence is inconclusive, collect a sample of the insects and/or damage and bring it to your local county Cooperative Extension center. If necessary, your county cooperative extension agent can arrange to have the sample examined by a specialist at NCSU. If it is impossible to collect a sample, contact the North Carolina Department of Agriculture & Consumer Services (NCDA&CS) and arrange for a state inspector to examine the damage. Knowing the moisture content of the wood is particularly helpful for problems with wood-boring beetle and wood-decaying fungi. Wood moisture content can only be determined using a moisture meter. Make sure that enough readings are collected so as to be truly representative of the area of concern. 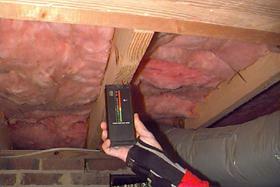 High wood-moisture readings (i.e., readings above 20%) in crawlspaces, attics or exterior walls of log homes could indicate problems other than simply insects. Mold/mildew growing on wood is a sign of excess moisture or high humidity, but not necessarily an indication that wood-rotting fungi are present. Correct these problems as you deal with any insect infestation. How severe is the problem or damage? In some cases, you can easily see that wood is severely damaged and must be repaired or replaced. Particularly for woodboring beetles, you probably will not see the true extent of any damage just by a simple visual inspection of the wood. One quick and simple (but not entirely accurate) test is to poke or probe the wood with a ice-pick, rock-hammer or other sharp tool. If the tool easily penetrates the wood and/or the wood splinters, then you may probably need to consult with a contractor or engineer who can determine if the damage is structurally signficant (i.e., could lead to structural failure of that wood). In the long run, it may be just as practical (and economical) to replace or brace wood that is damaged. Removing cellulose debris from a crawlspace is important and is required as part of a termite treatment. This debris usually consists of scrap pieces of lumber, but it can include paper and other cellulose-containing products large enough to rake up. Many people use their crawlspace as extra storage and place cardboard boxes directly on the soil. If you are going to store items in the crawlspace, maske sure you place them on top of plastic sheeting or bricks to keep them off the soil. You may save some money by doing this work yourself. If you are paying for a termite treatment, the pest management professional (PMP) is ultimately responsible for removing the debris or at least making you aware that it is supposed to be removed. You decide whether whether you do the work yourself or the PMP does it, but talk with the service technician to make sure that the work gets done properly. Before signing a service contract, read it thoroughly and have it explained carefully. A written proposal is required prior to any ongoing pest control work or for treatments involving termites and other wood-destroying insects. The services to be performed must be outlined. Don't settle for a contract that simply says "termite treatment". Except when using termite baits, a proper termite treatment usually requires trenching and treating of the soil along both sides of the foundation (including piers and other masonry supports in the crawlspace). Regulations also require that the section of the foundation where termites were found, plus concrete slabs attached to the foundation (such as garages and porches) must be drilled and treated. These steps should be explained specifically. The proposal/contract should also specify the name, concentration and approximate amount of the insecticide that will be used. The crawlspace is too low to allow adequate access to areas that need to be treated. The treatment requires indoor drilling that you may not want done because of cost, inconvenience or potential damage to expensive tile or flooring or because of HVAC ductwork in the slab. This situation most likely would occur with slab construction, where the floor covering must be drilled or removed order to drill the underlying slab and treat the soil beneath it. What type of treatment is being done? Will this treatment protect my entire house? What does he contract cover if I find termites in my home? As a smart consumer, you should contact 2-3 companies and compare the services and guarantees that they offer and the cost for these services. For more information, visit the NCDA&CS's website Homeowner's guide to Termite Control Service Agreements and Warranties. 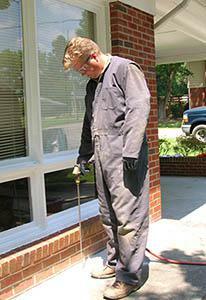 Termite inspections should be thorough and check foundation wall areas that might be hidden by insulation. Good communication with your pest control company helps prevent misunderstandings and problems. The pest control professional servicing your home considers you to be a valued customer and he/she is there to help you. Never hesitate to ask questions about the service you are receiving, about the chemicals being used in and around your home, or to get advice about what you should be doing to help keep insect problems from occurring. If you have a problem with some aspect of your service, call the company and talk to a supervisor. A good company wants to know when a customer is not satisfied so they can correct the problem and provide the type of service you want and expect. Just as we get second opinions for serious medical problems, you should have 2-3 pest control companies assess the problem in your home and present their findings and plan for correcting any problems found. Any waivers for work that will not be done. Are other companies including or excluding that work in their proposals? Contact your local county Cooperative Extension center for additional information about various pests. If you have a problem with the service that you are offered or currently receiving, contact the N.C. Department of Agriculture & Consumer Services - Structural Pest Control and Pesticides Division (919-733-6100).